It's a new economy and private practitioners must diversify for their practices to thrive. After becoming a licensed clinical social worker, I decided to venture into private practice. I was eager, optimistic and, like many others, had several preconceptions about what private practice would be like. To me, a private practice consisted of a licensed mental health professional such as a social worker or psychologist seeing patients one to three times per week for about 45 minutes to an hour for psychodynamic therapy. I rented an office space, furnished and decorated it to fit my image of “therapeutic,” and began to solicit referrals. I expected to work two evenings each week and then work my way up from there. I quickly discovered that being in private practice wasn’t quite what I expected and some redefinition was needed. Though I began to receive referrals, they did not come easily. I spent a great deal of time contacting doctors, community providers, and other potential referral sources. When clients did come to my office, I found that many people were apprehensive about being in mental health treatment. I educated them about therapy and its benefits, but the stigma attached to therapy was discouraging for many people who considered seeking services. Even those who were committed to receiving treatment had life issues that often interfered with consistently attending appointments. This is especially true in light of the changing economy. Considering that many people are juggling numerous responsibilities between career and family life, the time demands of traditional therapy are often a major challenge. Additionally, insurance companies are paying for a minimal amount of sessions, and many people do not have the financial resources to pay for traditional psychotherapy out of pocket. With all of these factors in mind, building a private practice that is completely dependent on revenue from psychotherapy is risky and, in many cases, unrealistic. 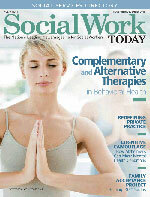 So should today’s social workers abandon any thoughts of building a private practice? Absolutely not. Psychotherapy is still an important and necessary form of treatment, particularly with the increasing pressures of surviving in today’s society. However, social workers should consider diversifying their private practices with other services that support and/or complement traditional psychotherapy and are more practical for today’s lifestyles and a damaged economy. • Fund-Raising: Volunteer time to spread awareness and raise funds/resources for a good cause. Choose a cause that is important to the populations you serve so you can directly connect your work to the cause. You will also be more likely to connect with people who work with the populations that you serve and who will become potential referral sources for your practice. For example, my colleagues and I collected school supplies and distributed them to the children in a local after-school program. In return, this program has called on us to provide psychoeducational groups at their program. • Educational Workshops: Offer skill-building groups to members of a local community organization. The skills offered should be supported by your professional experience. It is best to provide services for populations that you would also be able to serve in your private practice or for people who are potential referral sources for those clients. For example, my colleagues and I designed a group for adolescents that educated them about social issues and skills for coping with peer pressure. I have been contracted by local churches to provide these groups to the youths in their congregations. Those churches have also referred several clients to me for individual psychotherapy. • Training: Offer workshops to the staff of local organizations to help them improve their service delivery. This can range from a basic introductory workshop to full-length trainings for staff working with populations or social issues that you encounter as a clinician. For example, we often present workshops on educating community members about accessing the counseling services that are available locally and how to decide what types of referrals need to be made. In return, they often contact us to refer people who fit the criteria for the services we provide. • Public Speaking: Offer your expert opinion at events that relate to mental health or social issues. In this case, the term “expert” can be broad, as social workers have a wide range of knowledge about topics that laypeople do not. For example, at a National Domestic Violence Awareness Month event at a local church, I spoke about identifying the signs of domestic violence. I am not trained specifically on domestic violence, but my experience as a social worker has brought me into contact with many domestic violence victims, making me more knowledgeable about domestic violence than the average person. Of course, I inform my audience about the extent, as well as the limitations, of my experiences related to each topic I present. The participants will remember you when they need to access services that you provide. In addition, you build a reputation for yourself as a speaker, which can be another potential source of income. • Teaching: Conduct a class or workshop. For example, local community colleges often seek noncredit adjunct faculty to teach courses such as stress management or effective communication skills. They are often open to new course proposals from professionals with various expertise. Similar to public speaking, this provides a means for increasing your visibility and establishing a professional name in addition to another stream of income. • Authoring: Share your expert opinion with readers of local publications. Magazines and newspapers welcome professionals to educate their readers about various topics of interest. For example, articles about stress management or parenting are of interest to the general population, and expert advice on these topics is usually appreciated. This establishes your professional credibility and visibility for future referrals for therapy or other services. • Educational Groups: In lieu of traditional therapy groups, educational groups can focus on more concrete skills, such as parenting, couples, or communication, without the stigma of group therapy. They can also be provided in a nontraditional therapy setting such as a church or community center. • Consulting: Many businesses need assistance with improving internal relations or providing staff support, which presents the opportunity for social workers to offer services in the form of workshops, training, and/or ongoing consultation. Social workers’ expertise in human behavior can be an asset in assisting businesses with managing workplace relationships. • Become an Expert Witness: Local courts often seek professional reports and/or testimony to support legal proceedings. Social workers can serve as evaluators for cases such as custody, child welfare, and driving under the influence. Of course, everything is not for everyone, so it is not recommended that one social worker provide all of these services. It is important that you develop a niche based on your professional skills and personal preferences. At the same time, the laws of supply and demand suggest that the services you offer should correspond to the needs of the community you serve. Most often, one approach is not conducive to all, or even most, of your potential clients, so offering only one approach will tremendously limit the number of people who access your services. Therefore, offering a diverse selection of services is not only increasing your income potential but also responding to community needs. The previous suggestions should serve as a springboard for you to develop a practice that is based on your strengths and corresponds to the needs of your community. Social workers in private practice often feel isolated and lack the benefits of peer support unless they have networks in the community. Support can be gained by joining and participating in professional and community organizations or taking continuing education courses. Being part of a group will not only help you gain peer supports in the community, but it will also help you establish a network for referrals and keep you up-to-date with developments and opportunities within your profession. A practice design is a business plan for private practitioners. When creating a practice design, you must consider how much time you can commit to your practice, including office hours and time for administrative duties. This must be weighed against how much you expect to earn and how much you can afford to spend. Take into consideration the number of clients you want to treat, as well as current insurance rates, private pay rates, and sliding scale fees, in addition to expenses such as office space, office furniture/supplies, telephone, Internet, marketing material, malpractice insurance, and liability insurance. You will also need to consider what types of clients you want to work with, including their age, ethnicity, socioeconomic background, and specific clinical/social issues. Social workers are sometimes inclined to be a “jack of all trades.” While our ability to treat the person as a whole sets us apart from other professions, it is still helpful to have areas of specialty within our practice. This can be working with specific populations, utilizing certain approaches, or a combination of both. This allows us to become experts on one or a few topics and find a niche that will set us apart from other practitioners. A professional profile is similar to a résumé or curriculum vitae, but it is more detailed, personal, and written in a narrative format. In addition to the information normally included on a curriculum vitae, you should also include your treatment approach, professional goals, areas of special interest, and skills and/or experience that make you unique. Business cards are a basic marketing tool and an essential for anyone in private practice. They are the least expensive materials to print and the easiest to distribute. Business cards will include basic contact information, but because they are widely distributed and often the only marketing tool used, they should provide a snapshot of your practice. Therefore, in addition to your contact information, you may also want to include information such as services offered, logos, and quotes. You may also want to use brochures, pamphlets, or flyers in addition to your business cards to offer people more details about your practice. When beginning to get the word out about your practice, you should start by creating a marketing letter that will be sent to potential referral sources, such as medical offices, churches, schools, and community programs. In the letter, you should introduce yourself, talk about your practice, and attempt to establish a reciprocal relationship by offering a service in exchange for referrals, such as a free telephone consultation, referrals to their service, a brief workshop/in-service, or written material on a topic of interest. Having a Web site is becoming as common as having a business card. Your Web site should be attractive and user friendly and include helpful resources such as mental health/therapy information, articles written by you, or links to other articles that will attract potential clients/referral sources. Your Web site should also include your professional profile and contact information and should be designed in a fashion similar to your brochures, business cards, etc. If this idea is completely overwhelming to you, check out the Web sites of other practitioners and find out who designed their site, which is often listed at the bottom of the home page. — Keisha Cox, LCSW, MS, is a private practitioner and consultant in the New York metropolitan area.